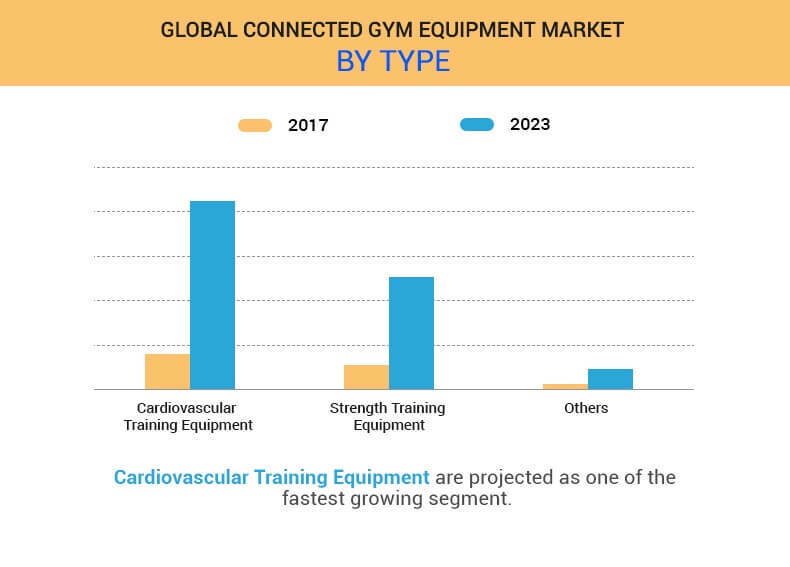 The Global Connected Gym Equipment Market size is expected to reach $1,048 million by 2023, registering a CAGR of 31.1% during the forecast period. The continued growing health concerns among youth and adults, increased adoption of smartphones, growth in obesity, and increased number of gyms and health clubs drives the global connected gym equipment market. Moreover, increase in income in developing economies is expected to propel the growth of global connected gym equipment market during the forecast period. However, high cost of smart equipment impedes the growth of the connected gym equipment market. This global connected gym equipment market is segmented based on type, end user, and region. The type segment includes cardiovascular training equipment, strength training equipment, and other equipment. Based on end user, the market is classified into residential, gym/health clubs, and commercial users. The adoption of connected gym equipment is expected to increase among the population. Sedentary lifestyles and hectic schedule have led to the adoption of in-home equipment. Exercising at home using smart treadmills, ellipticals, and other cardiovascular and strength training equipment saves gym membership expenses. However, space limitation and high cost of equipment restrain the connected gym equipment market growth of the home usage segment. Based on region, it is analyzed across North America, Europe, Asia-Pacific, and LAMEA. The Global Connected Gym Equipment Market in Europe is expected to grow steadily. The UK dominates the industry in Europe followed by Germany, France, and Italy. The increase in adoption of fitness exercises contributes to the growth of the connected gym equipment industry across the European region. The European connected gym equipment market is dominated by UK, constituting around 6,312 health and fitness clubs. It is characterized with presence of high obese population fueling the growth of the connected gym equipment market in the region. In the cardio equipment category, rowing machines, exercise bikes, and cross trainers are popular. High-end products such as rowing machines featured with wireless heart rate receiver and adjustable water resistance have gained considerable popularity in the UK. The major foreign companies operating in the UK include Technogym, Brunswick Corporation, Amer Sports, and others. As per a recent research, in 2014, about 20 million women were reported to be obese as compared to 9.8 million men. However, lower prevalence rate of obesity and lower urbanization rate of India as compared to China and Japan have restricted the penetration of connected gym equipment in the region. As per a study, in 2011, the number of health clubs were reported to be around 3,800, and the total number of memberships were in the range of 0.94-0.95 million. Moreover, as per recent statistics, in 2014, about 41% of the population are present in the age group of 18-45 years, and 25% of the population belong to the age group of 45 years. This has led to relatively higher penetration of strength over cardiovascular equipment in the region. The region is expected to witness significant adoption of cardiovascular as well as strength equipment due to the booming youth population and increasing health consciousness among individuals in this region. Thus, Asia-Pacific is the fastest growing region during the forecast period. Health clubs or gyms accounted for the maximum share in 2016. However, commercial users are projected to grow at a notable growth rate. It includes hotels, offices, public institutions, and hospitals. Hotels have emerged as a significant end user segment in other commercial users. The hotels have started with their integrations with fitness clubs and gymnasiums to provide an overall experience to the members. Business travelers are said to be one of the major end users of gym equipment in hotels, thereby providing a pleasant stay for the customers. The hoteliers have also initiated membership programmers to their frequent guests at affordable rates to increase their customer base. For instance, Trump Hotel, a U.S.-based luxury 5-star hotel, entered into a partnership with Technogym, a leading player in the market, to enhance travel experience of its health-conscious guests through its Trump Wellness Program. The report includes comprehensive analysis of the key players in this market such as eGym, Les Mills International, Life fitness, Precor, Technogym, Draper Inc., IncludeFitness Inc., Paradigm Health & Wellness Inc., Johnson Health Tech Co. Ltd., and Nautilus Inc. This report provides an in-depth analysis of the global connected gym equipment market to identify the potential investment pockets. 7.8. PARADIGM HEALTH & WELLNESS INC.
7.9. JOHNSON HEALTH TECH CO. LTD. Connected gym equipment market is projected to witness a sharp growth in the coming years owing to requirement of smart gym equipment across residential and commercial sector. North America is the largest market for connected gym equipment across the world. A larger base of obese population in the region has led to higher adoption of smart dumbbells, kettlebells, cross trainer, and other equipment. The market is driven by the prevalence of high obesity rates, which has led to greater adoption of connected gym equipment in the region. Rise in obesity rates, increase in health consciousness, and awareness of benefits provided by these smart devices would lead to larger number of new fitness facilities to set up and increase in membership rates. Such factors are expected to boost the requirement of the connected gym equipment market in the region. Increase in disposable income and rapid economic growth in Asia-Pacific have led to sedentary lifestyles and increased spending on fast foods, leading to unhealthy lifestyles. This has increased the incidence of lifestyle diseases such as obesity, diabetes, heart disease, hypertension, and other bone diseases. Growth in awareness among people about long-term consequences of such diseases has encouraged people to stay fit by working out at gyms and fitness centers. The use of strength training equipment among the youth population is expected to increase at a faster pace in the near future. These factors are anticipated to make Asia-Pacific, the fastest growing regions in the connected gym equipment industry during the forecast period.